To date, 46% of the companies in the S&P 500 have reported actual results for Q4 2018. 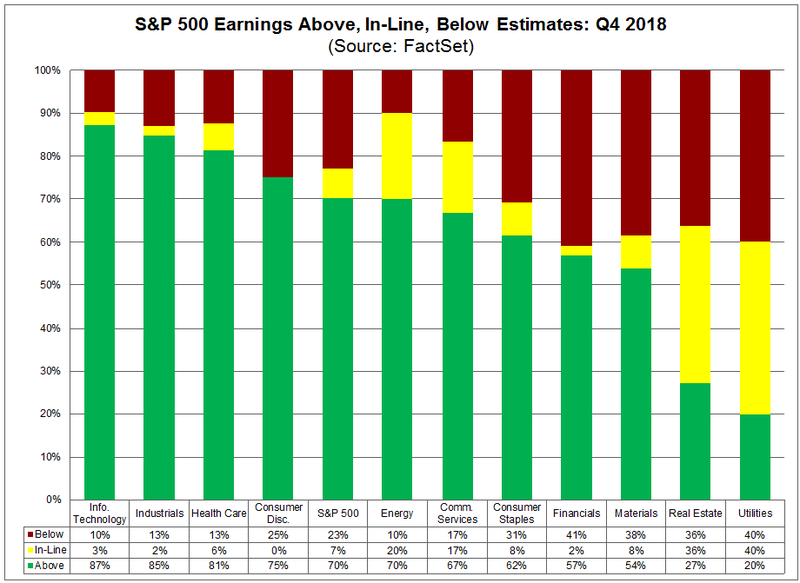 In terms of earnings, the percentage of companies reporting actual EPS above estimates (70%) is below the five-year average. In aggregate, companies are reporting earnings that are 3.5% above the estimates, which is also below the five-year average. In terms of revenues, the percentage of companies reporting actual revenues above estimates (62%) is above the five-year average. In aggregate, companies are reporting revenues that are 0.8% above the estimates, which is also above the five-year average. 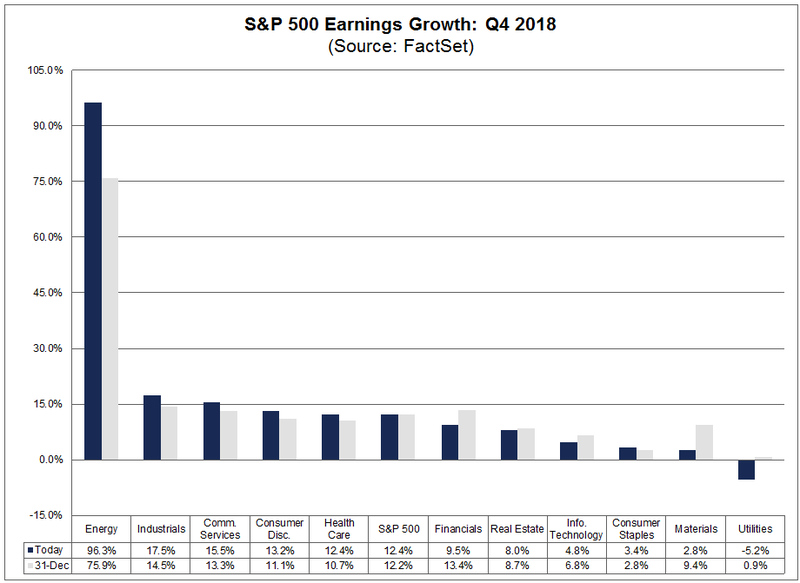 The blended (combines actual results for companies that have reported and estimated results for companies that have yet to report), year-over-year earnings growth rate for the fourth quarter is 12.4% today, which is above the earnings growth rate of 10.9% last week. Positive earnings surprises reported by companies in multiple sectors (led by the Energy sector) were responsible for the increase in the earnings growth rate during the week. If 12.4% is the actual growth rate for the quarter, it will mark the first time the index has not reported earnings growth above 20% since Q4 2017. However, it will also mark the fifth straight quarter of double-digit earnings growth for the index. Ten of the 11 sectors are reporting year-over-year earnings growth. Five sectors are reporting double-digit earnings growth, led by the Energy, Industrials, and Communication Services sectors. The blended, year-over-year revenue growth rate for the fourth quarter is 6.6% today, which is above the revenue growth rate of 6.2% last week. Positive revenue surprises reported by companies in multiple sectors (led by the Health Care sector) were responsible for the increase in the revenue growth rate during the week. Ten of the 11 sectors are reporting year-over-year growth in revenues. Three sectors are reporting double-digit growth in revenues: Communications Services, Energy, and Real Estate. 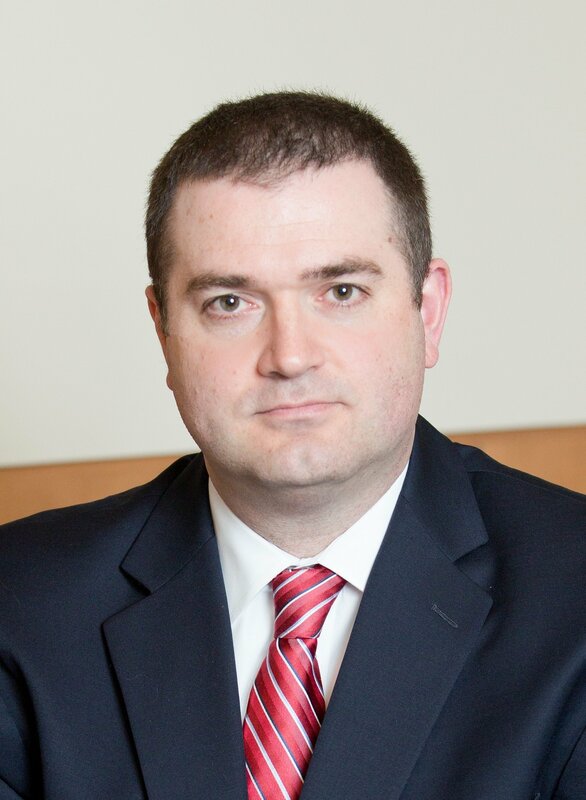 Looking at future quarters, analysts predict a decline in earnings for the first quarter of 2019 and low single-digit growth in earnings for the second and third quarters of 2019. The forward 12-month P/E ratio is 15.7, which is below the five-year average but above the 10-year average. During the upcoming week, 103 S&P 500 companies (including one Dow 30 component) are scheduled to report results for the fourth quarter.